with musician Liss Victory and Krish Mohan, comedian & social vigilante. In studio at Behrend BVZ on Rebel Girl Radio with Auda Kontroll. Hey all! I’ve traveled to Erie, Pa. where I’ll be joined by some of my very favorite musicians for the second release show of the “Kodachrome” record. This Sat., May 16, we shall converge on the King’s Rook Club from 10 p.m. till 2 a.m. and beyond for some acoustic rock n’ roll… or whatever you want to call it. 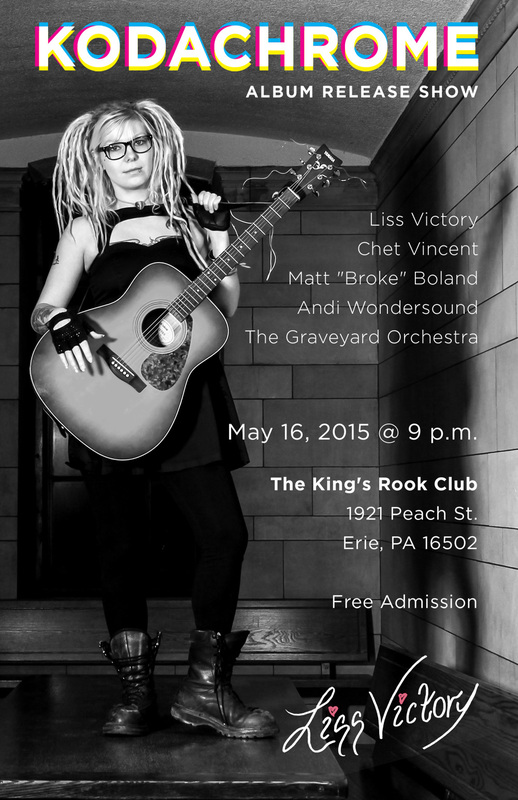 Joining me will be Matt “Broke” Boland, Andi Wondersound, and Chet Vincent of Pittsburgh’s The Big Bend. Each of us will share with you a rockin’ acoustic set of original music. And closing out the night, I’ll be performing with my full band, The Graveyard Orchestra. We all made this happen together. Even if you were unable to attend either release show, even if you were unable to back the Kickstarter, the support of my friends and the community brought this music into the world. In the form of a record. In the form of these events. In the form of a shared experience to mend our broken hearts and find the strength to fight another day. This entry was posted in Blog and tagged 7 inch, erie pa, kings rook club, Kodachrome 45, Kodachrome Heart, liss victory, music blog, victory on vinyl, vinyl record. Bookmark the permalink.